How do you improve on perfection? You enhance the details that make a real difference in the field. Engineered to excel, the latest incarnation of this renowned lens keeps you one step ahead. Improved AF tracking and exposure control, as well as VR SPORT mode, combine to deliver exceptional burst shooting. A brand new optical construction ensures superior edge-to-edge performance. And Nikon’s Nano Crystal Coat effectively reduces ghosting and flare. The build is light, thanks to the use of a fluorite glass element—and tough. Whether you shoot sports, action, news, or reportage, this FX-format lens can take your work to the next level. 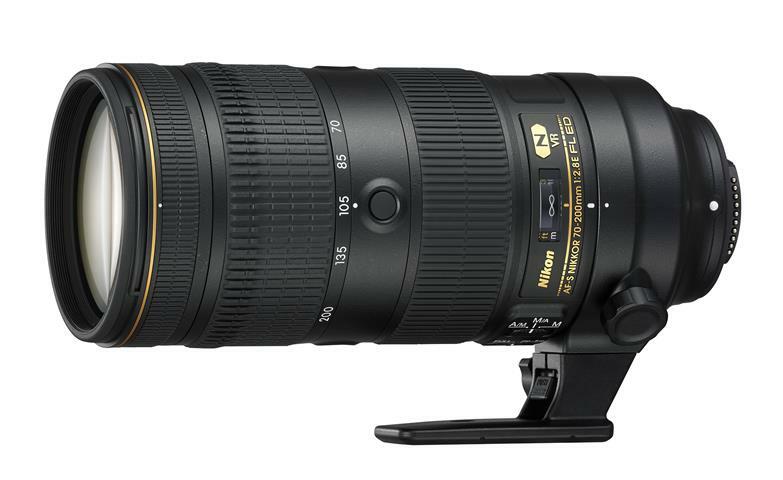 The 70–200mm focal length range (105–300mm when used with a Nikon DX-format SLR) covers all the bases. The fast f/2.8 aperture enables exceptional low-light performance and consistent exposure across the entire zoom range. The closest focus distance is now an impressive 1.1 m, and the maximum reproduction ratio has increased from 0.11x to 0.21x. Photographers working with Nikon's high-resolution image sensors and fast-shooting DSLRs will be ready for anything. Keep pace with the action without compromising sharpness. Nikon's VR minimises the effects of camera shake, letting you shoot at shutter speeds up to 4 stops slower than without VR.¹ Designed to reduce the blur caused by camera movement, VR now activates the instant you press the shutter halfway, and operation is quiet. SPORT VR mode delivers a more stable viewfinder image when shooting exceptionally fast action, or subjects that move erratically. It also allows a continuous shooting frame rate and release time lag similar to those that are achievable when VR is turned off. This lens even recognises when a tripod is being used, and adjusts accordingly in both Normal and SPORT VR modes. Built to partner with Nikon’s fast, professional DSLRs, this lens responds swiftly and precisely to autofocus changes. Now you can reliably track fast-moving subjects—even when they’re moving erratically, at random speeds, or approaching the camera quickly. And improved AF tracking isn’t the only advance. During high-speed continuous shooting, the electromagnetic diaphragm mechanism operates in sync with the camera shutter for fast automatic exposure control and consistency between shots. The diaphragm blade unit with drive mechanism is incorporated in the lens barrel, enabling smooth and consistent operation even during high-speed bursts. And Nikon’s Silent Wave Motor (SWM) enables ultra-fast, ultra-quiet autofocus performance with seamless manual override. This lens offers outstanding clarity and contrast throughout the frame. Compared to its predecessor, edge-to-edge performance is improved, and light fall off has been reduced. The new optical design effectively counters colour fringing and chromatic aberration, and controls distortion throughout the zoom range. It includes six ED glass elements, a fluorite lens element, and a High Refractive Index (HRI) element. And Nano Crystal Coat reduces ghosting and flare for greater image clarity. Thanks to the use of fluorite glass, the lightweight build of the lens comes at no cost to image quality. When you’re working down to the wire, the details can make all the difference. Configurable buttons on the barrel, a feature inherited from NIKKOR professional telephoto lenses, make it easier to change functions with your thumb while stabilising the lens. Zoom and focus ring positions are reversed compared to the lens’ predecessor for more balanced handling: with the zoom ring now towards the front of the barrel, directly below your hand, it’s easier to maintain a steady posture when zooming. The knurled rubber covering over the zoom ring also helps you achieve a firm grip, and zoom more easily while shooting blind. READY FOR THE FIELD: LIGHTWEIGHT, DURABLE, RELIABLE. Designed to withstand the rigours of professional use, every movable part of the lens barrel is extensively sealed to protect from dust and water droplets. And thanks to a new magnesium alloy lens barrel, and HRI and fluorite elements, this renowned lens has never been so light. The lens also boasts Nikon’s fluorine coating, which actively repels water, dust, and dirt without compromising image quality. The coating has been applied to the protective glass on the front and rear elements of the lens, where it also makes it easier to clean the glass without damaging the surface. Ball bearings in the tripod collar ring ensure smooth transitions between horizontal and vertical shooting.